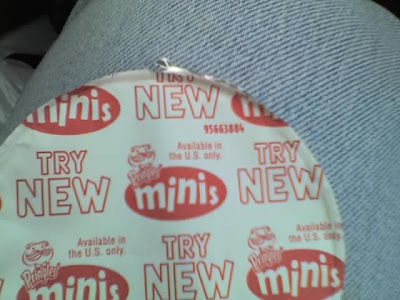 As El 3atal and I were eating some Pringles (you know, once you pop you can't stop is SO true for us), I noticed the advertising on the top for the new Pringle's minis. The only catch here is the fact the it clearly states they are "Available in the US only." Wasted money on packages sent to Jordan, hunh? I had to grab a shot of it, for your enjoyment. 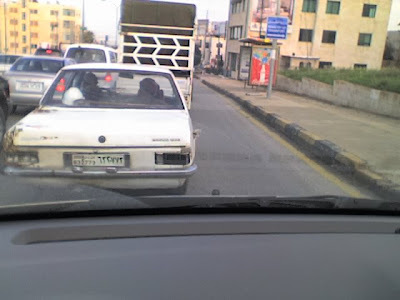 In the spirit of the post about the "emergency brake" (and I do use that term quite loosely), El 3atal and I caught sight of another driver using the same creative, out-of-the-box thinking. After laughing heartily, I snapped a shot with my trusty phone. In the below picture, notice the very unique gas cap. Not to be picky, but isn't that a fire hazard? For those of you who have yet to meet Kinzi, you know that pictures of her are (to put it in Southern-ese) as rare as hens teeth. 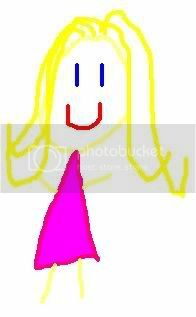 So, to help you along in recognizing her, ButterBean drew a fine portrait. Given the striking likeness, I wanted to share it with all bloggers out there. So, now should you pass Kinzi on the street, you can say Hi to her as well as MommaBean. You'll notice that, although I am some 30 years older than ButterBean, her style is a bit more complex than mine. Sad isn't it... As you'll see, drawing skill doesn't run in my family. Maybe they got some from El 3atal. Is there anyone else out there who can't help but think of Mickey Mouse whenever they hear (or think of) that song? Recently Teta and Jiddo Bean took a trip to the US. They visited with Teta bean's brother and his kids in the Mid-West. One of Khalo Bean's sons is running for his local School Board. For those of you who are not familiar with American politics, the school board is an elected office that serves as a policy making body for a district (or group) of public schools. Khalo Bean's son had a rally for his supporters, which he invited Teta and Jiddo bean to attend. At the event, he introduced them to the gathered crowd, Teta Bean and Jiddo Bean from Jordan. At that point, one of Ibn-Khalo Bean's good friends shouted "Wait a minute! My cousin lives in Jordan and is married to El 3atal." There was much rejoicing as Teta Bean and Cousin Bean realized that they were among family they had not yet met. It sounds as if the event was lots of fun. And, it just proves that it's a very small world when MommaBean's cousin and El 3atal's cousin are good friends yet go for years without realizing that they are related by marriage. The world gets smaller and smaller, doesn't it?